What I’m talking about is finding cheap clothing online. I’ve looked through so many sites and couldn’t find the right site for saving as much money as I can with 599fashion.com. The highest price you’ll find on their site is $5.99. Everything is $5.99 and under. They have cheap children’s clothing, cheap plus size clothing and so many other great finds. All of their clothing is stylish and comfortable. They have dresses, jackets, jeans and many other wonderful styles. Here you’ll find the black shirt (brown one we got just like it) and the red pair of socks of the set. Each pair of socks ends up making great as an outfit when paired with black jeans or blue jeans. The site, 599fashion.com, also has great looking leggings to match these. They have stylish clothing that is really cheap and can be paired up. Outfits when putting them together might cost at the most $20. That means socks, shoes, dress or shirt and pants. They also have cheap dresses that can be purchased online. If you’re like me and not as small as the two beauties in the photos, don’t worry. They do have Plus Size clothing too. Here is the blue cheetah print top and socks that match. I know, they are two different prints, but the colors are “spot” on. The shirt cost $5.99. The material is strong and soft. The “Novelty Crew Socks” comes in a pack of three. I chose the tan / blue / red pack. They have other assorted colors to choose from as well. The pack of three costs $3.99. I know where I live here in TN, you can’t get 3 pairs of socks of this quality for that price. They cost more than that. By purchasing these cheap socks online, I’m saving myself money. Having six children, I’m all for saving. As I write this, there are only 23 of these left. They are tin totes that your child can use as a crayon / pencil box or even to keep candy or carry snacks in. My daughter uses her’s to keep candy in and sometimes she resorts to keeping odd things in it, even her earrings. It measures 5.5 inches. This is from the Frozen movie made by Disney. 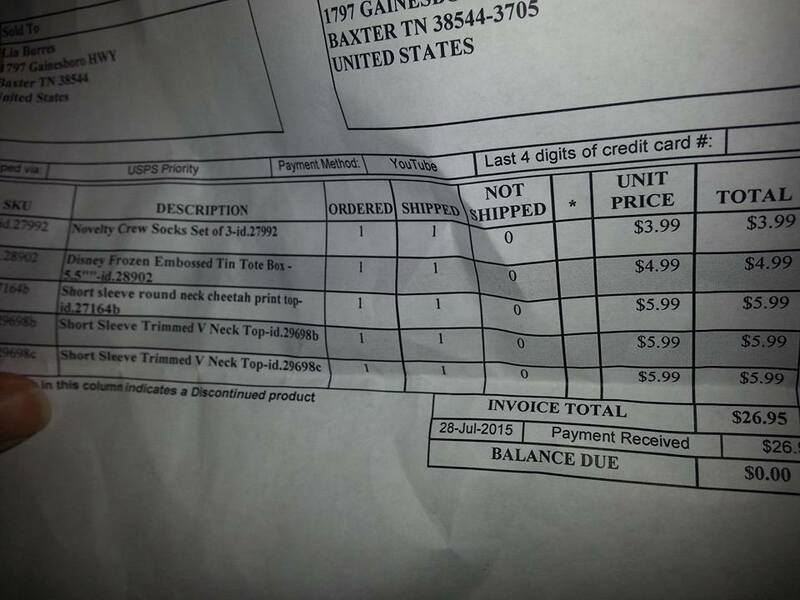 Check out the invoice. For the three pairs of socks, tin box, cheetah print shirt, brown and black shirts, it totaled out to be right at $27. It arrived within four business days of placing the order. They shipped it via priority USPS (United States Postal Service). 599fashion.com has something cheap for everyone in the family for all occasions and so many different accessories to choose from. Be sure to also check out the hair accessories on 599Fashion.com. They have cheap hair accessories. There are all sorts of them and they are all very stylish and can help to complete every outfit. The one shown in the photo is only $0.99! Oh, be sure to check out the phone accessories and their sunglasses! You’ll love those! This is a sponsored post. Items were received for this to be posted, no other compensation has been given. All thoughts are my own and no other’s. This post is in the guidelines of the FTC. The original photos taken by myself are the only items that have been received. By liaburres Comments Off on Looking for cheap reliable clothing? I know where to get them.